WHITSETT, N.C., Sept. 5, 2018 /PRNewswire/ -- Medical device manufacturer medi USA announced the launch of the new ready-to-wear circaid® juxtafit® essentials armsleeve. The juxtafit essentials armsleeve is an inelastic compression wrap for the management of lymphedema and lipedema. Designed with patented juxtaposing band technology and made with a soft and breathable fabric, the juxtafit essentials armsleeve applies graduated compression from the wrist to the upper arm. 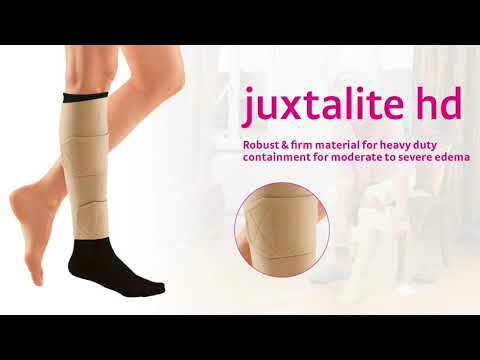 The easy-to-use juxtaposing bands promote patient self-management and improve quality of life, enabling patients themselves to easily adjust their compression wrap throughout the day. The juxtafit essentials armsleeve also contains silver to prevent odor and the spreading of bacteria in the garment. circaid products are designed with a patented Built-In-Pressure System™ (BPS™) that enables multiple, measurable, targeted compression ranges in a single product. "It is extremely valuable for patients with lymphedema to be as independent as possible in self-management of their condition, and to maintain their quality of life," said Christopher Miles, Senior Manager of Clinical Services at medi USA, Occupational Therapist and Certified Lymphedema Therapist. "The circaid juxtafit essentials armsleeve is easy to use, low-profile to fit under clothes, and is lightweight and breathable so patients feel comfortable wearing it." The juxtafit essentials armsleeve is available in left and right variants, three lengths and six sizes for optimal comfort and efficacy. medi also offers custom versions of the circaid juxtafit essentials armsleeve, as well as ready-to-wear and custom options for hand compression. The new ready-to-wear juxtafit essentials armsleeve joins a full range of compression products offered by medi in their circaid inelastic compression line. medi creates compression products that fit every patient for all stages of venous and lymphatic conditions. To learn more, visit mediusa.com.